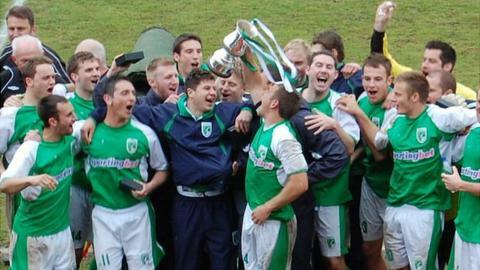 Guernsey FC will travel to Crowborough Athletic for the preliminary round of the FA Vase. In its inaugural season the island side won the Combined Counties League Division One and promotion to the Premier Division. Crowborough play in the Sussex County League Division One and reached the fifth round of the vase in 2008. The game is due to place at the Crowborough Community Stadium on 1 September with a 15:00 kick off. The two divisions they play in are the same level in the FA pyramid. The winners will be home to either Farnham Town or Kent Football United on 15 September, with an away fixture against Whyteleafe for whoever makes it to the 1st round proper. Last season's FA Vase was won by Dunston UTS with a 2-0 win over West Auckland Town at Wembley Stadium.